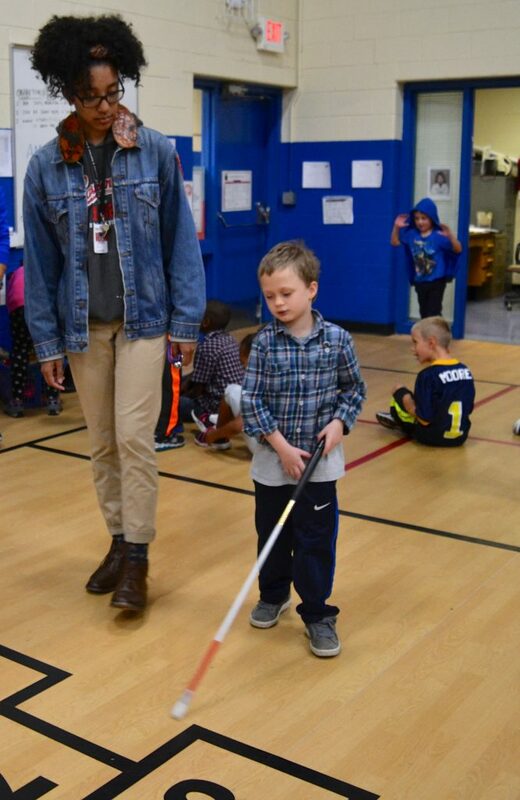 Editor’s Note: This is Part 2 of a story on how one AAPS elementary school welcomes and helps two visually impaired students succeed in their kindergarten and second grade classrooms. Inclusion, diversity, hard work, and compassion are among the values celebrated at Bryant Elementary. In fact, the school was named for custodian Clifford E. Bryant, who for 25 years beginning in 1946, was known as a diligent, helpful friend to all. Bryant’s 312 students today are thriving in that culture of caring, and two of those students exemplify the spirit of working through challenges. Khara Joseph, a kindergartener who has been blind since birth, and second grader Tristan Ross, who has just slight peripheral vision in his right eye, are both enrolled in general education classrooms. They are involved in all activities as their peers, and are able to successfully complete their schoolwork, much of which is modified to meet their individual needs. Principal Roberta Heyward says all students are welcome for their unique abilities and talents, and Khara and Tristan fit right in. “Khara and Tristan are two of our many students who continue to teach us all about the importance of acceptance, inclusion, and the importance of celebrating and caring for one another,” she says. There are 50 visually impaired and eight blind students in AAPS, according to Kathy Christensen, a Washtenaw Intermediate School District certified Orientation & Mobility Specialist/teacher consultant. The WISD Visually Impaired staff works with AAPS to make sure students with special challenges receive all the support they need to be successful. Teachers’ assistants provided by AAPS are especially needed in the early grades to help reinforce braille instruction and orientation & mobility, and produce braille and tactile graphics to make print material accessible and assist with access to the curriculum. 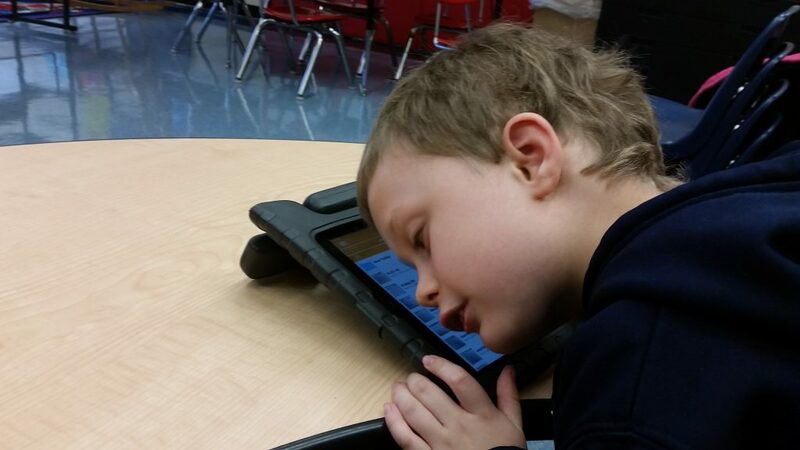 Technology helps the students move toward independence, and includes electronic braille writers (Braille Note), braille embossers that produce braille, Electronic Readers for the Blind (MP3), talking calculators, speech output software on the computer, talking money identifiers, as well as any number of apps on the iPhone for the visually impaired and blind. Tristan Ross, who is known for his outgoing personality and exceptional vocabulary, was born two months prematurely and has vision in only one eye, and even that is minimal and peripheral, says his mother, Carly Balmer. Balmer says she’s been thrilled with his education at the Westerman Preschool & Family Center as well as at Bryant. Tristan uses the latest technology to keep up with his work. Asia Dobbins, teacher’s assistant for Tristan, says it’s a pleasure to spend time several days a week with the witty Tristan, who sometimes uses a British accent just for fun. “He has a large personality that is very different from any other child that I’ve known,” she says. Michael Hagen has been Tristan’s teacher for the past two years, and says he, too, has learned from the experience. Asia Dobbins, left, is Tristan’s teacher’s assistant. He says teaching a child with a challenge was something he really wanted to do.